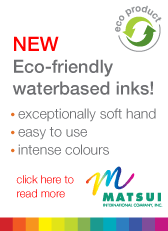 Matsui’s new 301 ECO-Series Water Based Ink System includes binders, pigments and inks that are specifically designed for today’s manual and high speed automatic screen printing presses. The eco-friendly, PVC free 301 ECO-Series inks offer environmental and practical advantages over traditional plastisol inks currently being used in high volume textile shops. Creates vibrant colours when blended with "Neo Pigments" up to 15%. Use with Matsui CMS (Colour Matching Software) to create Pantone® colours. Great for pirnting spot colour discharge prints. Brite Discharge White is designed to be printed through lower mesh counts to establish an opague white discharge print. Great for spot white printing. Clear 301 C is a high mesh mixing base for printing as a clear or mixing with "Neo Pigments" to achieve an extremely soft hand feel. This product has a translucent appearance. Foaming Base HT is a high concentration foam/puff for creating 3D prints. You can blend "Neo Pigments" up to 15% directly in to the base to create a variety of colours. Foil Adhestive TFG 301 is an adhestive base for flock sheets and foil transfer. It has excellent adhesion qualities. Can be printed on most textile fabrics where a printable adhestive in needed. Metallic Binder 301 is a silver metallic base that can be used as a stand alone shimmer or can be blended with "Neo Pigments" to create colour. Stretch Clear 301 is a clear mixing base for 'performance' and high stretch fabrics that can be mixed with "Neo Pigments" to achieve an extremely soft hand feel and excellent elasticity. This product has a translucent appearance. Stretch Clear 301 is a clear mixing base for 'performance' and high stretch fabrics that can be mixed with "Neo Pigments" to achieve an extremely soft hand feel and excellent elasticity. Under Base Blocker 301 Gray is a base that is printed down first to block dye sublimation on polyester fabrics. Neo Pigments are 13 concentrated Eco-friendly pigments that are base depenent and can be blended up to 15% in Matsui bases to create Pantone® Colours. Various Fixers, Retarders and other products are available to assist your printing needs. See TDS for further information.